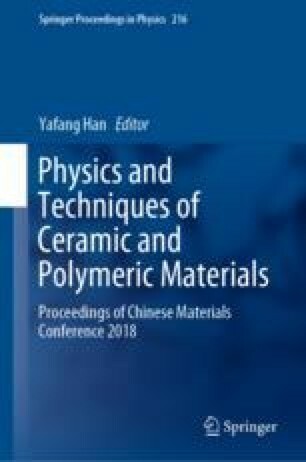 Porous Al2O3 ceramic cores were prepared successfully by dry-pressing assisted of precursor-derived ceramic technology. Among, Al2O3 powders with flake shape were used as the matrix and silicone resin powders were used as the precursor. The effects of sintering temperatures on the properties of Al2O3 ceramic cores were researched. Results showed that the silicone resin powders had well-cohesive property, making the Al2O3 grains bond closely under pressure. During the sintering, the pyrolysis of silicone resin happened and the amorphous silica formed firstly at low temperature. The increasing temperatures made the amorphous silica gradually crystallize. And when the temperature was more than 1500 °C, the silica reacted with Al2O3 to form the mullite phases. With the increase of temperature, the shrinkage rate reached the maximum value of 0.95%, and the bulk density reached the maximum value of 2.53 g cm−3, and the porosity reached the minimum value of 33.11%, and the bending strength had the highest value of 105 MPa at 1500 °C. We would like to acknowledge the financial support provided by United Innovation Program of Shanghai Commercial Aircraft Engine (AR910), the National Natural Science Foundation of China (Nos. U1560202, 51690162), the Natural Science Foundation of Hebei Province (Grant No. A2018210123), Open Project of State Key Laboratory of Advanced Special Steel, Shanghai University (SKLASS 2017-03).